The New York Times has an interesting piece on everyday instances of stateness under ISIS. From the article, it appears that in addition to its macabre coercive powers, Al-Baghdadi’s caliphate managed to develop significant levels of infrastructural power and bureaucratic capacity. Below are some examples. They also suggest that the militants learned from mistakes the United States made in 2003 after it invaded Iraq, including the decision to purge members of Saddam Hussein’s ruling party from their positions and bar them from future employment. That decree succeeded in erasing the Baathist state, but also gutted the country’s civil institutions, creating the power vacuum that groups like ISIS rushed to fill. A little more than a decade later, after seizing huge tracts of Iraq and Syria, the militants tried a different tactic. They built their state on the back of the one that existed before, absorbing the administrative know-how of its hundreds of government cadres. An examination of how the group governed reveals a pattern of collaboration between the militants and the civilians under their yoke. ….. It was daily commerce and agriculture — not petroleum — that powered the economy of the caliphate. In Kremer’s model, population will grow and eventually population will be high enough that research and development will proceed fast enough to push income per capita high enough to trigger the demographic transition and thus break the Malthusian proportional link between resources and technology on the one hand and population on the other. After that link is broken, economic growth will predominantly take the form not of Malthusian increases in population but rather Industrial Revolution and Modern Economic Growth increases in living standards and labor productivity. The whole post is worth reading. The empirical bits are clear and easy to follow. See also here. In my Political Economy of Development class I make sure that my students understand the relationship between demography and human development — (i) the impact of demography on state development; and (ii) the impact of state development on markets and economic growth and development. To that end I often use these three illustrations. Up until the mid 1990s tiny Europe had more people than all of Africa. In the next 30 years Africa’s population will grow by about 800 million people. By 2050 the Continent is projected to have 2 billion people; and half of the children being born in the world will be African. There is no reason to believe that the African experience after these demographic changes will not follow established correlations between population size, state development, and technological change. Caution: This is not an apology for President Kagame and his autocratic tendencies that have resulted in carnage and death in the DRC, Rwanda and elsewhere. At a conference last year a US State Department official told a group of us that Rwanda was so polarizing that even at the Consulate in Nairobi the DRC crowd did not get along well with the Rwanda crowd. It is not surprising why that might have been the case, or why the present analysis on the commemoration of the 20th anniversary of the 1994 genocide remains polarized. 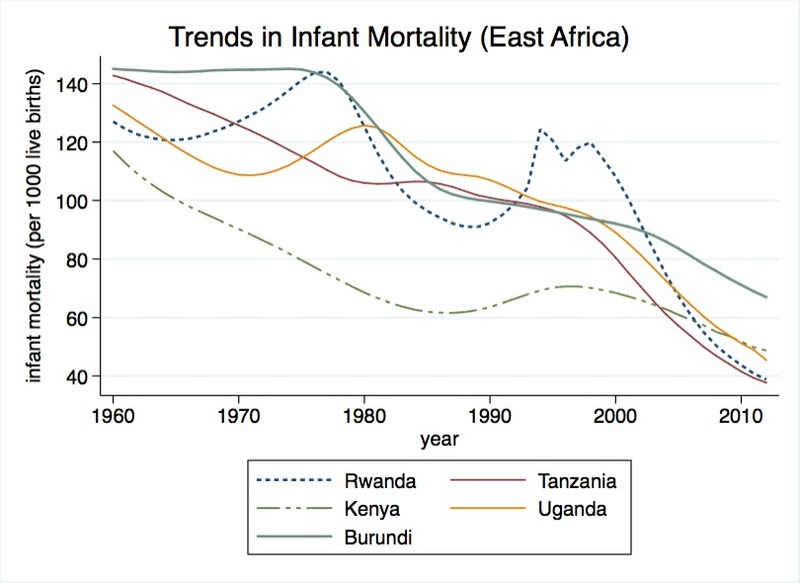 If one just looks at the improvements made in advancing human welfare since President Paul Kagame and the RPF took power (see graph, data from the World Bank) it is hard not to arrive at the conclusion that ordinary Rwandese are unambiguously better off. The country is the least corrupt in the region and has also been consistently ranked top in the ease of doing business. But there is also the side of the Kigali government that most reasonable people love to hate: the murderous meddling in the DRC and the oppression and occasional murder of dissidents at home and abroad. Those who admire what President Kagame has done tend to emphasize the former, while his critics tend to emphasize his autocratic tendencies which have made Rwanda the least democratic country in East Africa (see below, data from Polity). Many wonder if the post-1994 achievements are sustainable enough to outlast President Kagame’s rule. So is Mr. Kagame a state-builder or your run of the mill autocrat whose achievements will vanish as soon as he relinquishes power? In my view, I think that Rwanda is the best success story of state-building in Africa in the last 20 years. I also think that this (state-building) should be the paramount consideration for those who care about the Rwandese people and want to help them achieve greater freedoms. The fundamental problem in states like CAR, Sierra Leone or Liberia has never been the insufficiency of democracy. Rather, it has been the problem of statelessness. The contrast between Rwanda and Burundi is instructive (see both graphs, the two are neighbors with similar ethno-political histories. 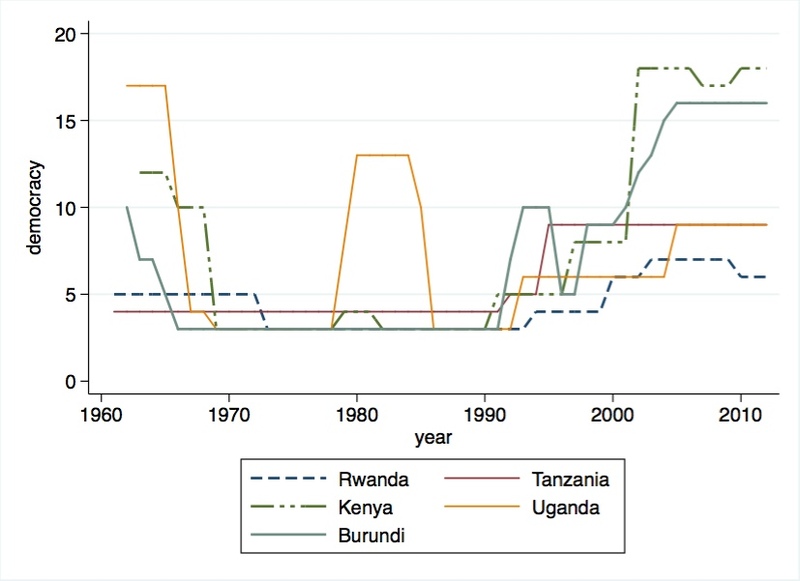 Rwanda has historically had a stronger state, though. See here and here). Despite the latter being the second most democratic state in the region, it has consistently performed the worst on nearly all human development indicators. Part of the reason for this is that Burundi remains a classic papier mache state confined to Bujumbura and its environs. May be I am too risk averse. But I am scared stiff of anything that could lead to a recurrence of the horrors of the early 1990s stretching from the Mano River region to the Horn. As a result I am always skeptical of activism that takes state capacity (including coercive capacity) for granted. With this in mind, the fight against autocratic rule in Rwanda should not come at the expense of the state-building achievements of the last 20 years. The international community and those who genuinely care about Rwandese people should be careful not to turn Rwanda into “democratic” Burundi in the name of democracy promotion. Interventions will have to be smart enough to push President Kagame and the ruling elite in the right direction, but without gutting the foundations of political order in Rwanda. Absent a strong state (even after Kagame), the security dilemmas that occasioned the 1994 “problem from hell” would ineluctably resurface. Lastly, I think the level of discourse in the “Rwanda Debate” could be enhanced by the extension of the privilege of nuance to the case. For example, if all we focused on were drones killing entire families at weddings in Yemen or the horror that is the South Side of Chicago we would probably get mad enough to ask for regime change in Washington. But we don’t. Because people tolerate the “complications and nuance of American politics.” The same applies to less developed countries. Politics is complicated, everywhere. And those who approach it with priors of good-or-bad dichotomies are bound to arrive at the wrong conclusions. One need not be a Kagame apologist to realize the need for a delicate balance in attempts to effect political change in Kigali. Before you hit the comment button, notice that this is neither an apology nor an endorsement of autocracy in Rwanda. It is a word of caution regarding the choices outsiders make to accelerate political change in Rwanda. Tyranny is not the panacea to underdevelopment. But neither is stateless democracy. For background reading on the 1994 genocide in Rwanda see Samantha Power’s Problems From Hell; Mahmood Mamdani’s When Victims Become Killers; and Philip Gourevitch’s We Wish to Inform You That Tomorrow We Will be Killed With Our Families. Somalia: Police Development as State Building? International and local power brokers see police as indicators of legitimacy and international recognition, but the international community’s vision of police development as state building is undermined by Somali politicians, officers, and businessmen sharing a political and entrepreneurial under- standing of the police role. The picture is further nuanced by influential Somalis who regard many of the structures and skills associated with Western policing as desirable, even as they manipulate the values and procedures promoted in its name. The propensity of donors to see police development as a tool for not only state building, but also social engineering is marked. But so is the pragmatic response of Somalis. Officers in Somaliland and Puntland take what they value, manipulate what they can use, and subvert approaches that offend the sensibilities of their conservative society. Meanwhile, the SPF’s primary concern is to acquire the heavy weapons, vehicles, fuel, and communications equipment it needs to survive today. Somalia’s experience shows that formality is not required for the governance associated with state building, but relative security and stability are, and there are limits to the role police can play in facilitating this: Somalia remains dangerously insecure. That the three forces are subject to the un- predictability that dependence on local power brokers and international funding introduces suggests that success depends on balancing local security levels and politics against international imperatives in a way that goes beyond current conceptions of state-based governance. That is Alice Hills in a paper on policing in Somalia in the current issue of African Affairs. $500 million, and for what? Congolese go to the polls on Monday, the 28th of November. The result of the election is almost a foregone conclusion. 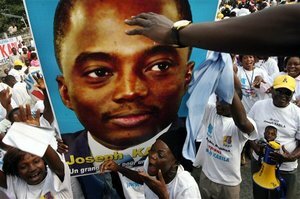 Incumbent president Joseph Kabila looks set to win another term in office – another 5 years to continue the mismanagement of the DRC’s resources through shady mining deals. If I were in charge of the promotion of democracy in the DRC I would push for a system of staggered elections, both nationally and at the provincial level. I would also try and broker a deal to create a government of national unity in Kinshasa (representing the provinces) and competitive elections at the provincial level. In my view, the longer that everyone keeps pretending that the Congo – with its 70m+ and landmass the size of Western Europe – can be run by a single central government in Kinshasa – the longer it will take to put the country on the path of institutional development that will be conducive to long run economic growth. Centralized state development definitely makes sense for smaller African states (think of the infamous trio of the Mano River basin). But if you are the DRC, capacity development in the capital must necessarily be accompanied by the strengthening of institutions at the provincial level – with more emphasis, in my view, on the latter than the former. The number one problem facing the DRC right now is woeful state incapacity. It is doubtful that elections alone will force politicians’ hand in the right direction. For more on the elections follow Congo Siasa.